Seaside, OR (Tamara) National Historical Parks. 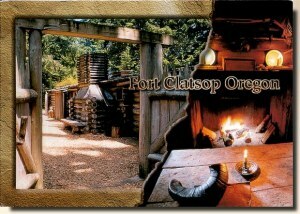 Fort Clatsop near Astoria, Oregon. Fort Clatsop is a replica of the winter camp of the Lewis & Clark expedition. The fort wax built in December of 1805 as a home to the 45 men of the expedition until their departure in March 1806. The maps and information on the Pacific Northwest brought back by the Corps of Discovery awakened the interest of a young and expanding nation.